This reader believes the Isle of Wight council’s reasoning for closing All Saints’ School in Freshwater is flawed and says what the village needs, if the Island Plan is not fantasy, is a new, central, non denominational school. Last Thursday I attended a demonstration at the West Wight Sports and Community Centre. 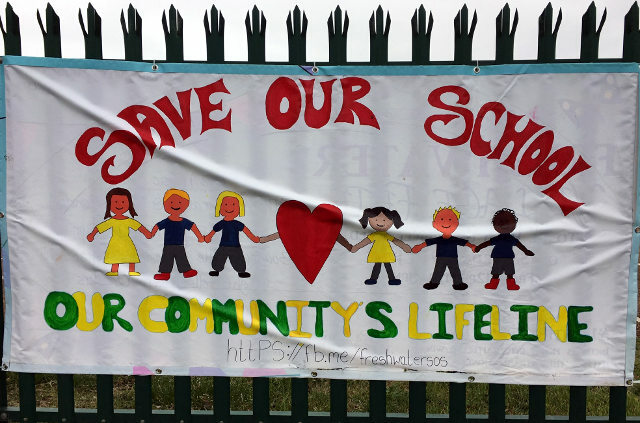 The demonstration was to protest against the proposed closure of All Saints’ Primary School in Freshwater. The protest was well organised, peaceful and vociferous, organised by the parents of the pupils. The irony was the location, the Isle of Wight Council were holding a meeting here, a facility they have ceased to fund, and thus, threatened its continued existence. So now they want to close a Freshwater school and have produced a document called a “delegated decision report”. I believe their reasoning is deeply flawed and, for example, takes no account of the Island Plan to build 400 or so homes in Freshwater (all for childless couples presumably). The school which has had a long and illustrious past currently has its difficulties, but surely the answer is to fix them before taking the ‘nuclear option’. In the short term they may save some money, but will make the lives of Freshwater parents and children much more difficult. What Freshwater will need, if the Island Plan is not fantasy, is a new, central, non denominational school.